Compared to a scenario where regulations are held constant at levels observed in 1980, the study finds that the difference between the economy we are in and a hypothetical economy where regulatory accumulation halted in 1980 is approximately $4 trillion. Does regulatory accumulation—the buildup of regulations over time—alter businesses’ decisions to make investments that lead to innovation and technological growth? How do these changes affect economic growth? Economic growth has been reduced by an average of 0.8 percent per year from 1980 to 2012 due to regulatory accumulation. Regulations force companies to invest less in activities that enhance productivity and growth, such as research and development, as companies must divert resources into regulatory compliance and similar activities. While 0.8 percent may seem small, economic growth is an exponential process—next year’s growth depends on this year’s growth, which depends on last year’s, and that means the gap between what the economy could be and what it is grows over time at an increasing rate. How much is $4 trillion? It’s about one quarter of the US economy in 2012, and equals $13,000 per American. 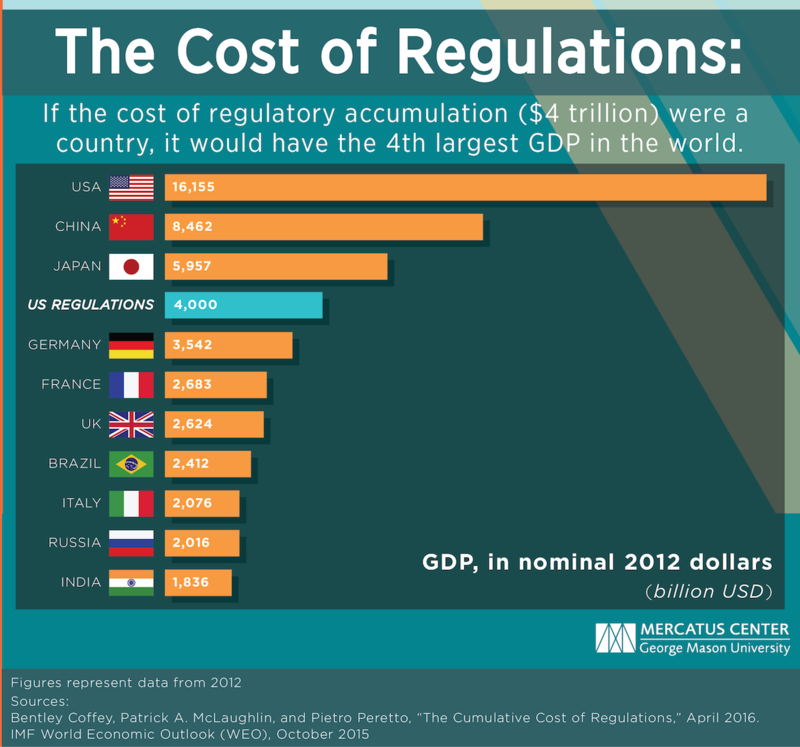 The $4 trillion dollars in lost GDP associated with regulatory accumulation would be the fourth largest economy in the world—larger than major countries like Germany, France, and India. The study and comparison in the chart above highlight the need for regulatory reform and problems associated with the accumulation of regulations. Federal regulations have piled up over time to the point that they contain more than 1 million individual regulatory restrictions. When regulators add more rules to the pile, analysts often consider the likely benefits and compliance costs of the additional rules. But regulations have a greater effect on the economy than an analysis of a single rule in isolation can convey. The buildup of regulations over time leads to duplicative, obsolete, conflicting, and even contradictory rules, and the multiplicity of regulatory constraints complicates and distorts the decision-making process of firms operating in the economy. This study shows that, by altering the investment choices of firms, regulatory accumulation slows the process of knowledge creation and the development of technology and innovation—the key drivers of economic growth over the long run.